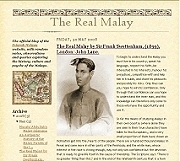 Share your comments, observations and queries - visit 'The Real Malay', the official blog of the Sejarah Melayu website. The Sejarah Melayu Library is perhaps the largest public on-line collection of books and other texts on the history of the Malay archipleago and its surrounding region. Consisting of over 500 documents in electronic PDF format, the library includes books related to specific topics in the history of the Malay archipleago and its surrounding region, travelogues, general histories, academic papers, encyclopedias, dictionaries and other types of references. Essential downloads include the Sejarah Melayu itself, the Kedah Annals, Hikayat Abdullah and The Commentaries of Alfonso d'Albuquerque. Click here to visit the library. The Sejarah Melayu Gallery houses thousands of images of portraits, engravings and maps related to the history of the Malay archipelago. 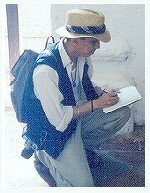 These range from ancient inscriptions and medieval engravings to 19th century colonial watercolours and photography. In addition, the collection features postcards, stamps and coins from the last 150 years. Click on any of the images above to visit the relevant image gallery.